Equip your weapon and get ready to help save Isya! Hit the 'I' key or click the Inventory icon in the lower-right portion of the screen. Your weapon will be in your inventory; right-click to equip it. To attack a monster, double-click on it. 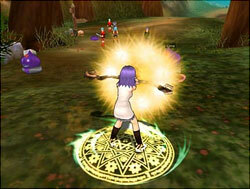 Mages start with an additional skill - the magic missile spell in their skill bar. Select a monster and right-click on a spell or skill to use it. Slain monsters often will drop items, so be sure to pick them up! Some are valuable and you can sell them to other players or NPC's. If you get low on life, use an HP stone by hitting the 'Q' key or an SP stone by hitting 'E'. You can also assign them to your quick bar skills by opening your skills window, clicking on dragging them to the quick bar of your choice. When not fighting, rest in your mini-house to regain health and spirit points! Hit the 'H' key or click on the house icon in the bottom-right corner of the game window to bring up the mini-house menu. Click the Rest ('HOME' button) to enter your house. If your house does not appear, move to a less crowded area or away from NPC's and try again. Press 'H' again to exit your mini-house. Keep all the Summoned Beast Leather you find! These are valuable early in the game and can be sold to other players. A lot of the items you will find while fighting enemies can also be used for crafting items later in the game. You can choose up to two crafting professions. Keep the items you find that relate to your chosen crafting professions, and sell the rest to make money. For instance, keep the ones related to potions and scrolls, but sell the ones relating to stones.